This is our collection of tickets to be fixed up today. Thanks to everyone for all your feedback on the redesigns last week. Rolling out the designs on Tuesday was intense on a lot of levels, and I wanted to circle back and let y'all know how things have shaken out. There were lots of little bugs that y'all sussed out, and then of course a lot of subjective feedback about the design. (I'm begging y'all to sit with the "I just don't like it" stuff for a couple weeks.") Some of these bugs were easy for me to to fiddle with myself (yay WordPress! ), but some of them necessitate Kellbot's time, which is extremely limited given the fact that she's also rebuilding the Tribe right now. Selected sites are linked in the top nav bar. These sites selected based on reader behavior patterns. 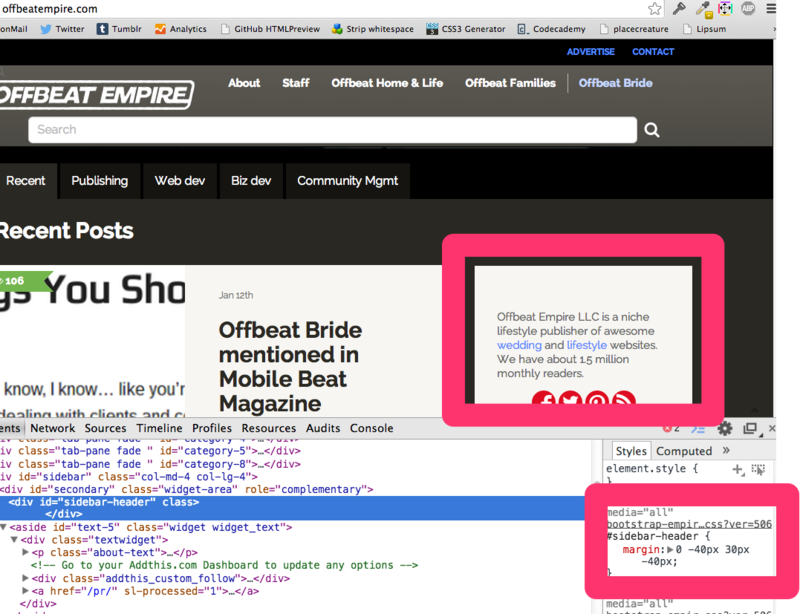 Then, ALL sites are linked in the footer of every page. When you finish reading one site, just scroll to the bottom of the page and click on the next you wish to read. It's not perfect, but I'm trying to strike a balance between navigation real estate and usability. Related Post New templates launched on five of our sites! The hardest part of a redesign like this is balancing the priorities. There are issues that affect advertisers and vendors, which of course must be prioritized because money. There are issues that affect readers, which need to be prioritized because that's the whole reason we exist. And then there are issues that affect staff and editors, which I want to prioritize because we're the ones working on the sites all day. And then of course there's the fact that it's Christmas this week and oh by the way we're also rebuilding the Tribe right now HA HA HA. Simply put, there are not enough hours in the day to get it all done, so Kellbot and I are just doing the best we can to prioritize. 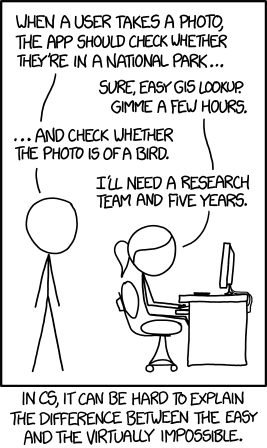 Sadface, why can't I embed xkcd.com/1425 ????? You're the best. Even if your "security" "settings" are CENSORING MY FREEDOM OF EXPRESSION and SUPPRESSING MY IDENTITY and, um, you know. Stuff. You guys are awesome! I love the new layout. I haven't run into any bugs, which is pretty good since I've been browsing all the sites on and off since 7am. Christmas week at work is sloooow. I'm totally lost in the Offbeat rabbit hole now…. Oh jeez. I wish you'd let me know about the distorted envelope — that's part of AddThis, and I could have reported the bug to them. I'm getting used to the redesign, and love that you guys are keeping the site up to date. I'm not sure if I'm the only one who has this issue, or if it's fixable, but thought I'd mention it anyway. When browsing on my phone (and I believe particularly in areas of poor signal like when I'm on a train), sometimes an article will load, then after a minute or so the page will black out (including the bits I've already read), leaving only the site header. If I scroll up and wait a moment sometimes it comes back, otherwise I have to reload the page. I think, with the old design, only the comments section would white out and the article itself was more stable (although I also think it happened more regularly – it was consistently a race to be able to read the comments before they disappeared, whereas now it happens less frequently). It only happens on my phone, and never on my laptop, and these are the only sites I've noticed it happening on (although it's also the set of sites I spend most time on, which may be part of the noticing thing). I've never noticed it happening on the home page, only on the articles, but, again, I don't spend as long on the home page. The phone is the HTC Wildfire S, I think, and runs Android. I have no idea about the browser as it's just what the phone came with, but if it's relevant I can probably find out. So, yeah, completely non specific feedback for the win! For a more specific suggestion, although not a bug as such, two of the 'going viral' links in the block of eight at the bottom of both Home and Bride are currently taken up by the homepage and the blog homepage. It may make more sense to limit that to articles? Thanks for this feedback! The browser you're using is definitely an important issue here — we're looking good on Chrome for Android, but I can't promise the site is going to work on proprietary mobile browsers. (I'd humbly suggest installing Chrome on your phone, but that's up to you!) That said, it'd be great to know which browser you're using, just so I can check my stats and see how many people the problem is affecting. I went into the settings and the phone I have is the HTC Desire C (I think the Wildfire S was what I had before I dropped it and it broke). The browser is just labelled 'Internet' and is what came with the phone. The only identifying thing I can find in the settings is a version number, which is 4.0.2221163361.487694.408139 – googling this doesn't bring up anything particularly helpful, it just seems to be an android browser. If you know of a way for me to get more helpful information for you, let me know, but that's all I have right now. I guess if no one else reports the same issue it's just me with this problem, so as annoying as it is it's probably not worth your time following it up. Mm. Yeah, based on my stats, this is a proprietary browser used by a pretty small number of people, so it's difficult for me to prioritize limited developer resources to troubleshoot it… I'd suggest installing Chrome. You might love it! As a website nerd who does a lot of troubleshooting also works with my team's developers to fix bigger problems, I LOVE how deep you guys roll with this kind of thing. I had never used awesomescreenshot.com before, so thanks for the tip! I also love supportdetails.com (totally not shilling for them, but it's awesome for people who might not know their browser version, etc., which can be a crucial part of a bug report). Thanks! I'll take all the nerdlove I can get this week. Okay, so I don't know if anyone else commented yet, but when I'm on Offbeat Home I see five posts by scrolling, and then I click "see more posts" and it scrolls me back up to the top and I have to scroll again through the five I just saw to see the "more". I keep expecting it to just take me to the new posts, not the ones I just saw. Hey, Jo! Yep, that's an issue that we're working on … we should have it fixed within the next couple weeks. It looks fine on individual post pages, and it looks like the margin-top on the #sidebar-header is the problem; when I change that value to 0, though, the ABOUT header is still missing, which is genuinely weird. Hi, nice work! This may not technically be a bug, but it's bugging me: I wonder if it's possible now (or could be made possible) to collapse/hide the fixed menu bars at the top of the screen. — If I have my browser zoom set at 100%, or if smaller but I don't want my browser window filling my entire screen, the menus take up a good 1.5 inches of my screen (the search bar moves to the next line and everything in the menu gets even bigger to fill the space), below the full inch already devoted to the Chrome address bar/tabs. That's nearly 1/3 of my screen that can't be used to view the content, and I prefer to read as close to eye level as possible. — I'd screen-shot it but can't upload here. 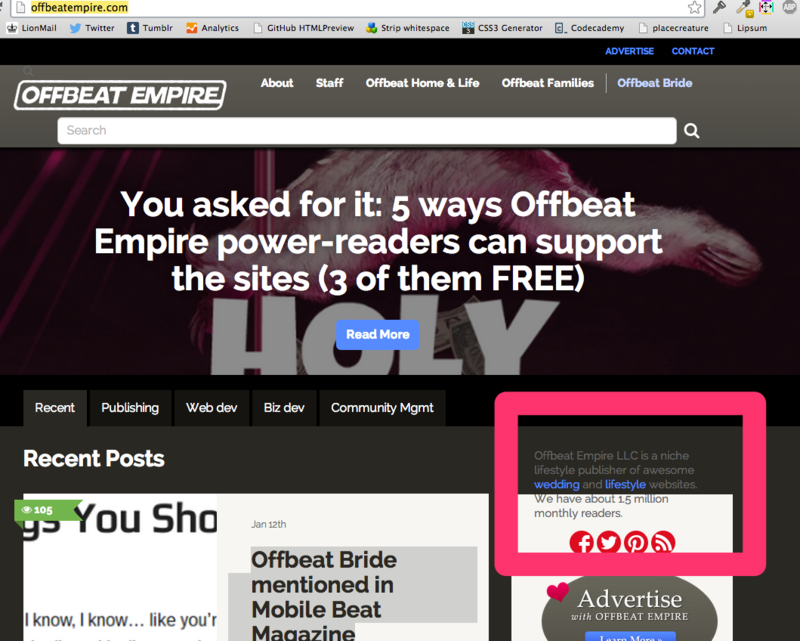 Also, I've only seen it on this page so far, but at all zoom levels the OFFBEAT EMPIRE logo is partially obscured by an errant menu link reading Offbea/Empire (right edge of text is cut off at edge of the logo). EDIT: This randomly fixed itself after I posted. On my computer the post pictures on the main page of the blog (for none recent posts) do not normally show the title of the post, but if I hover over them they display a translucent grey screen with a white text title on top of them. On my phone, where there is no hovering, the white text is always there but with no grey screen. As a fair few of the icons have white as a large component (particularly on OBE, where it's not usually photographs) the titles are sometimes unreadable. Pemcat, what operating system and browser are you using? Also, if you can scare a screenshot (I love http://awesomescreenshot.com for this kind of thing) that'd be incredibly helpful. My browser details are as above (so if I'm the only one seeing the issue please ignore me!). I'm not sure how to upload a screen shot from my phone so will email it to you.